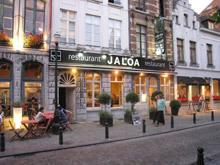 A lot of the cuisine in Brussels have a touch of French influence, but if you are looking for a distinctive French style restaurant, then visit one of these which are noted for their excellent service and central location. If these doesn’t seem to suit your taste then there are about 600 French restaurants in Brussels – do a search on Resto.be to find one that will suit your price range and location. A gourmet restaurant that is very expensive but completely worth the price. The chef treats food like art. The menu meals start from €47 per person including selected wines. Service is excellent; every course is served to you with a brief explanation of the ingredients and preparation style. A chic and refined French restaurant in a townhouse on Avenue Louise. It is quite expensive but the food is top-notch and the waitresses are all in red. The restaurant also has a branch in New York City. A large French restaurant in near Place Chatelain that has distinctive architecture and wonderful service. They can accommodate large groups (with private rooms available) and have a large menu to accommodate all tastes. A French restaurant with international-fusion dishes too. This is a moderately priced restaurant with wonderful flavours. You will be nestled in a cosy living-room style restaurant that offers a warm dining experience. Terrace dining (al fresco) is available on warm summer evenings. Rue Berckmans 30.